Manatees and Florida are synonymous in our present day. Florida provides a habitat for the aquatic mammals along its entire coastline. Manatees prefer the warm waters of Florida and the Caribbean. 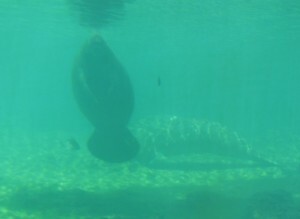 Called the West Indies Manatee, the creatures are a big draw for tourism. According to recent reports, manatees in Florida are doing well. However, it wasn’t always so. Back in the late 1960’s, manatee numbers had dropped into the mere hundreds. The species was put on the endangered species list and measures were put in place to preserve them, including preserves and slow zones for boaters. Fast forward fifty years and the manatees have rebounded, their numbers exceeding 6000. The resurgence in numbers has created conflicts. Boaters and developers, tired of the restrictions, want their freedoms returned. Those aiming at protecting the manatees are on the other side of the line, arguing that the manatees still need protection, despite the population growth. Under pressure that included a lawsuit, the U.S. Fish and Wildlife Service reclassified the manatee from the endangered list to the threatened list in the spring of 2017. The lawsuit pressed that agencies weren’t following the law with reclassification while opponents sought to continue manatee protection. The protections for manatees under the threatened status are, reportedly, the same as under the endangered status. The fear is that changes in government regulations will strip away some of the safeguards. While disagreeing on how to respond, both sides agree that the resurgence is good news.